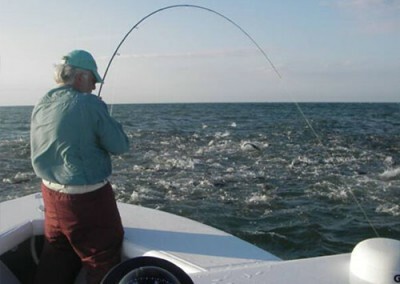 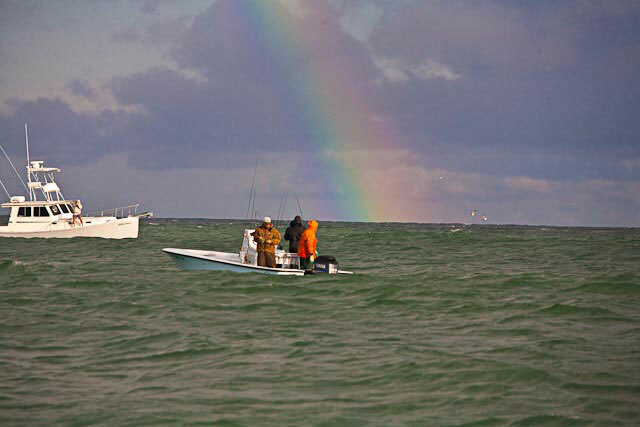 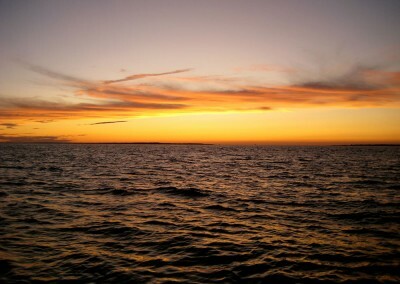 I’ve fished with Captain Merritt White both in Montauk and Key West. 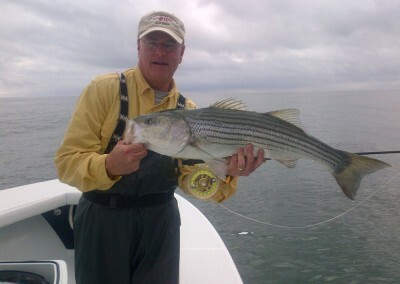 He knows a lot about fishing and has taught me plenty! 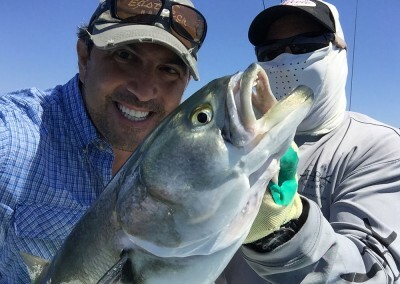 He is utterly fearless and will fight to the bitter end to get his clients onto fish. 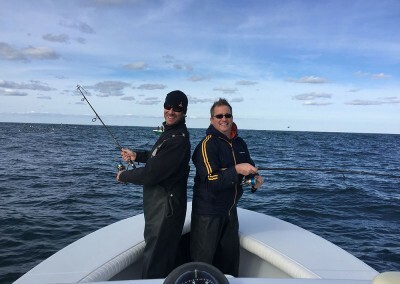 Best of all, he is a guy you like to be on a boat with! 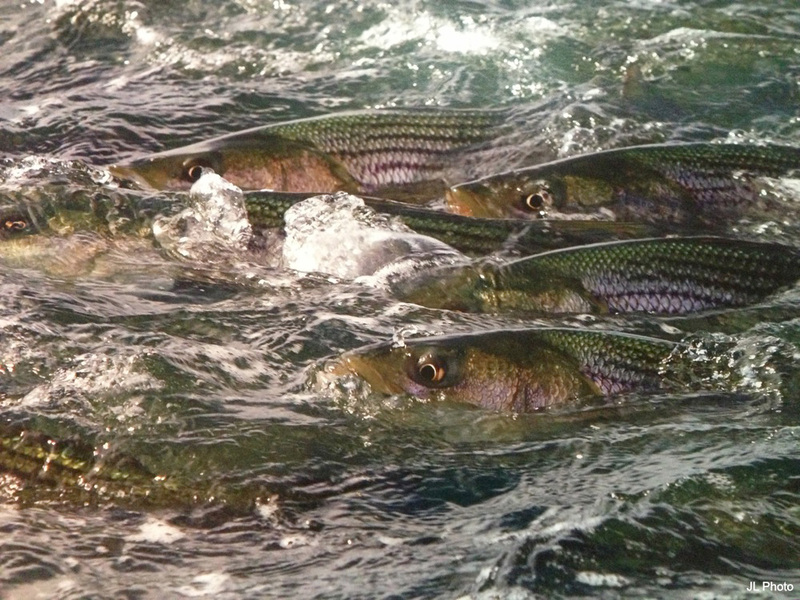 September through November signifies the annual Fall migration in the North East. 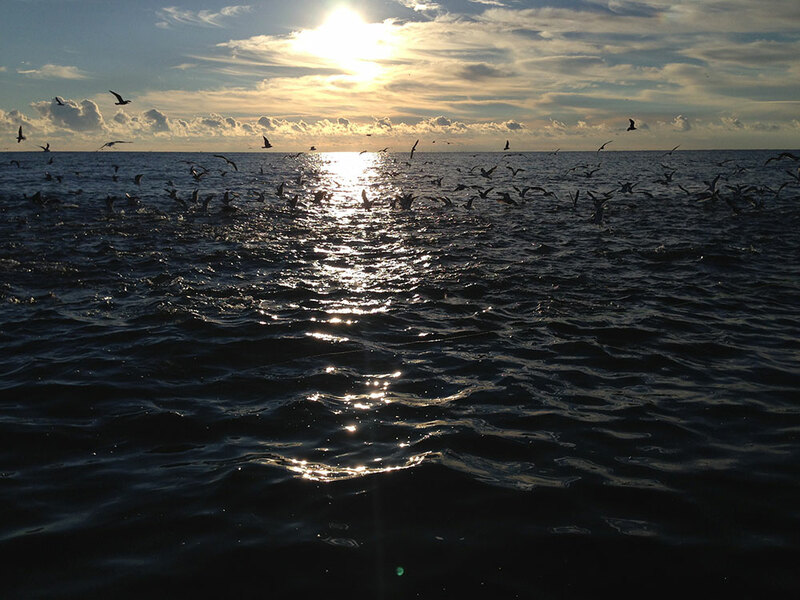 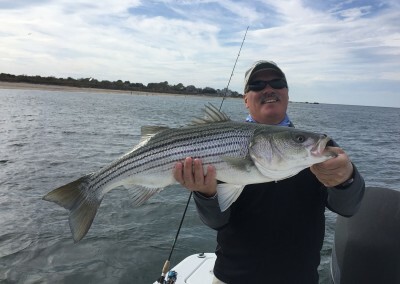 As the days grow shorter and the surrounding waters begin to cool, bluefish, false albacore and striped bass feed with abandon on the myriad of bait that is being flushed out of the local bays and estuaries. 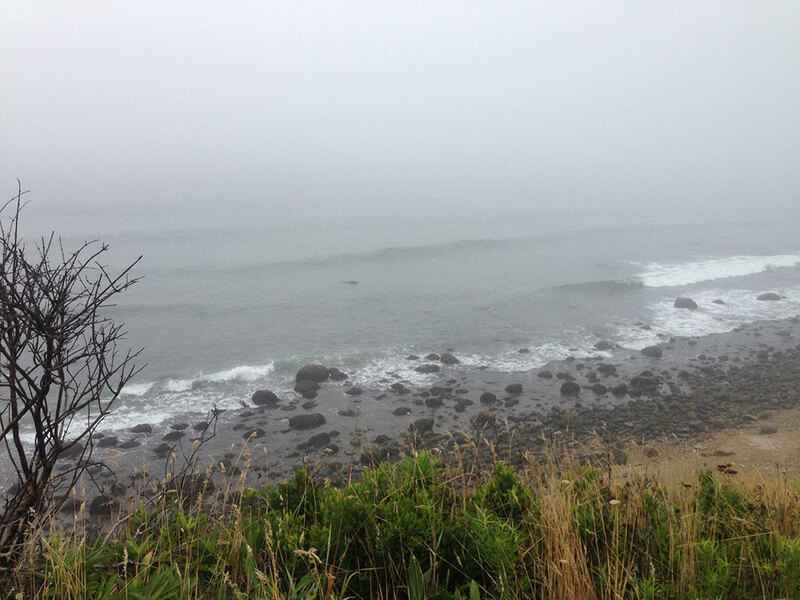 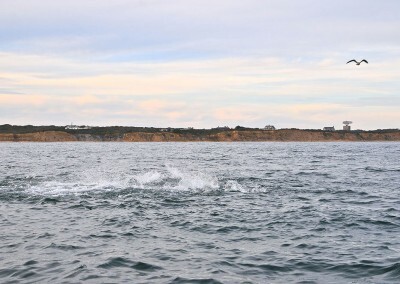 Montauk, at the most eastern tip of Long Island’s South Fork, becomes center stage for the Fall run. 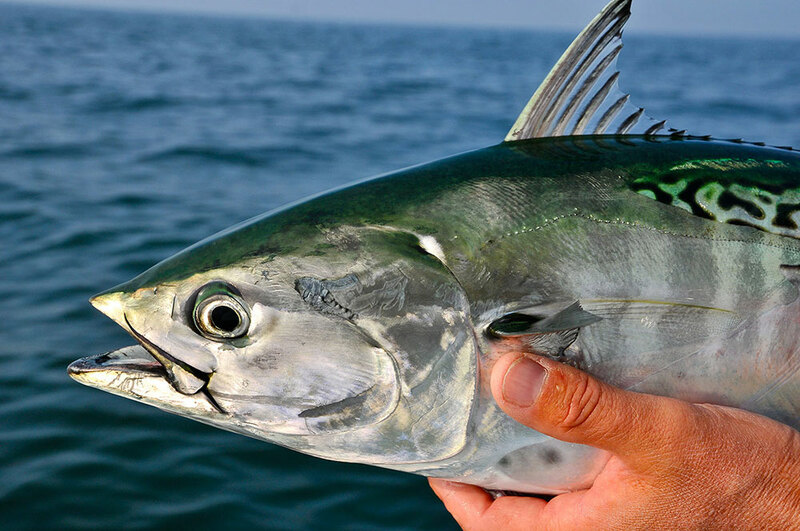 The presence of our Gulf Stream adversary, the false albacore, is symbolic in that it alerts us to the beginning of the Fall migration and it is a welcome relief from the typical outings of the “dog days of summer”. 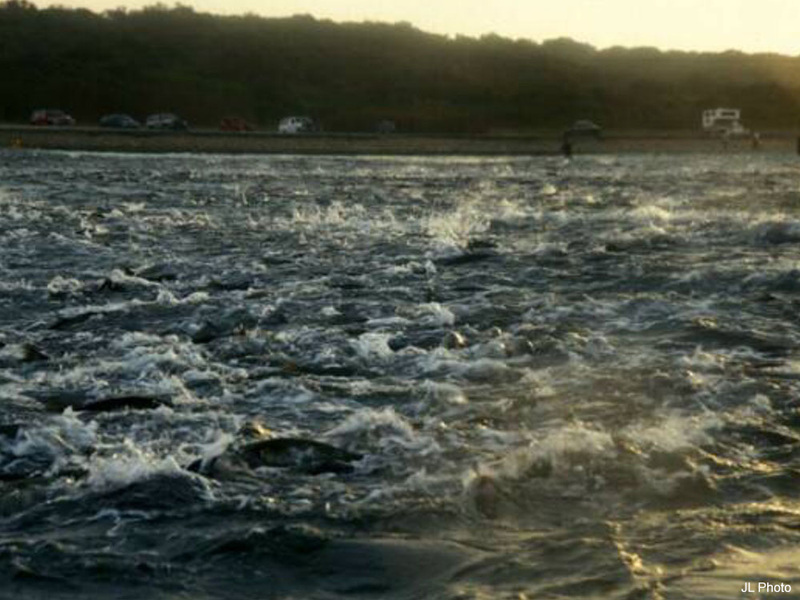 For anglers in the North East there is no better fly or light tackle quarry. 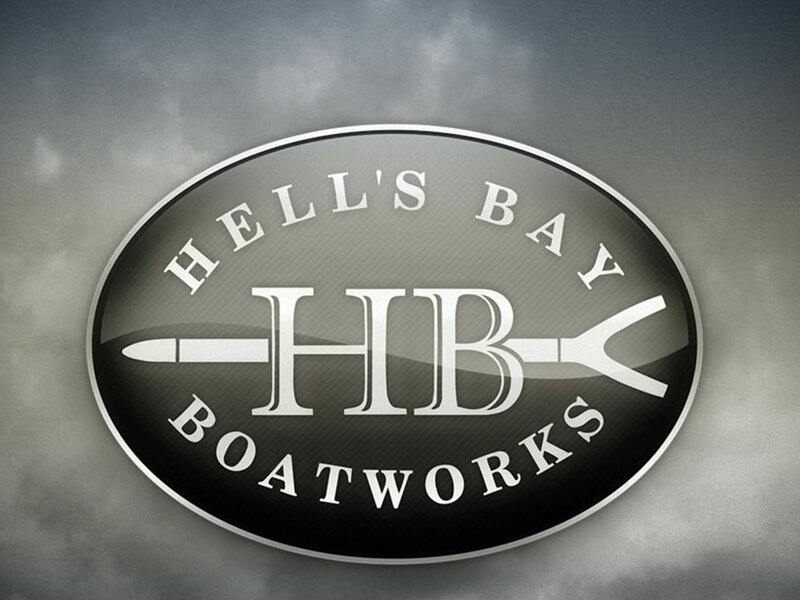 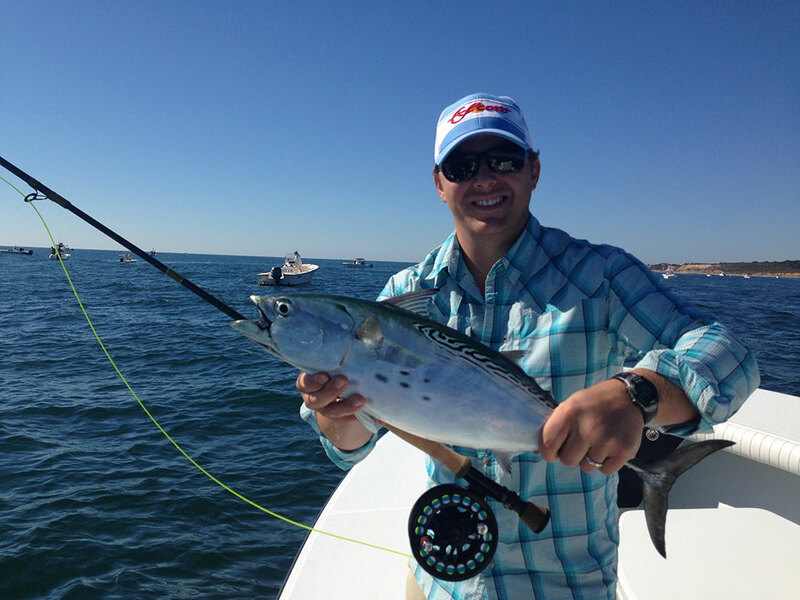 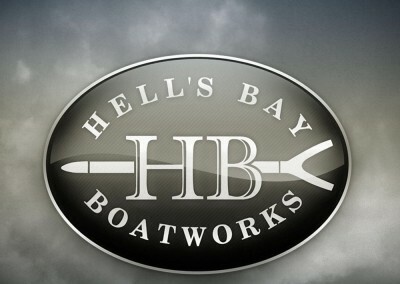 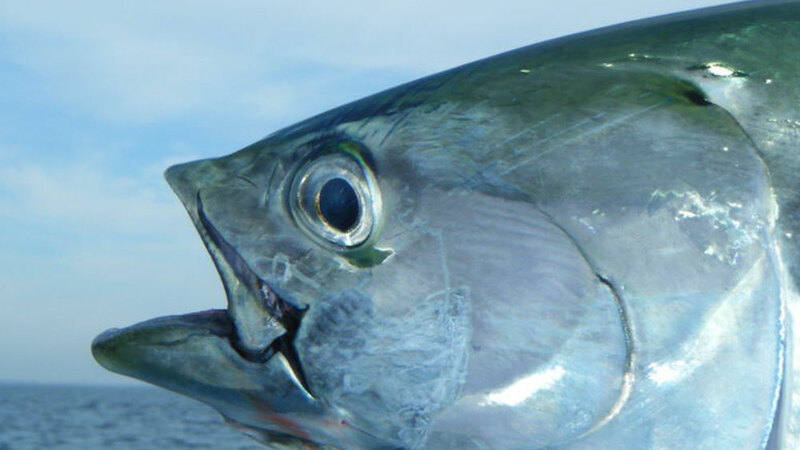 The false albacore or “fat albert” as it has been affectionately called, is all about speed! 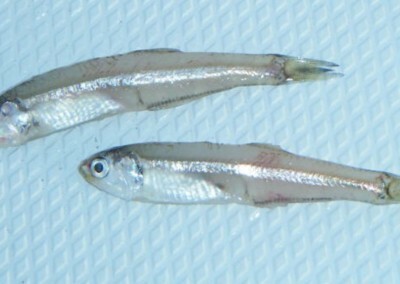 With a fusiform body shape, fin pockets, and a stiffened, sickle shaped tail, albies can really move out or turn on a dime toward their unsuspecting prey. 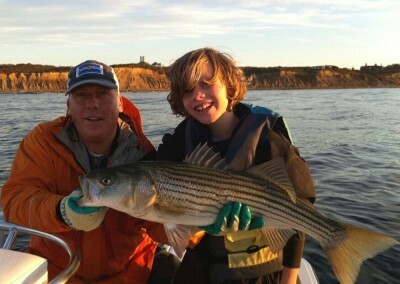 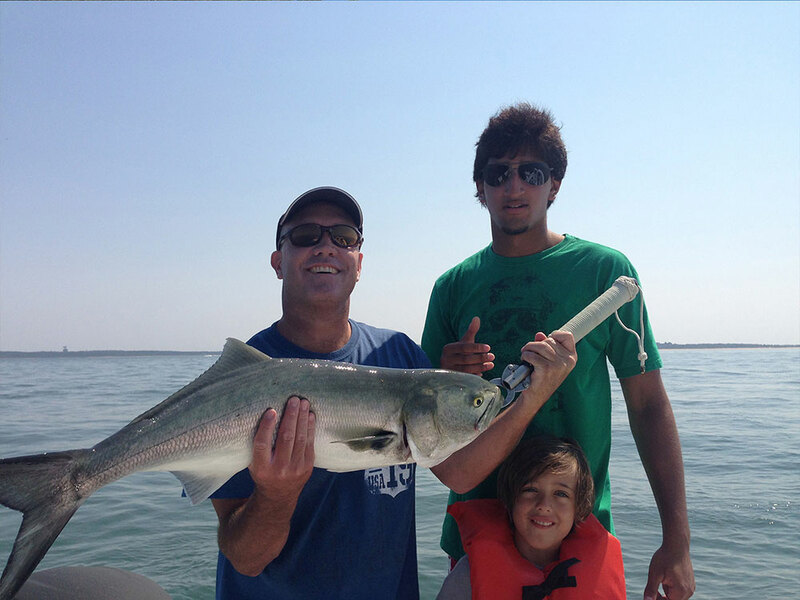 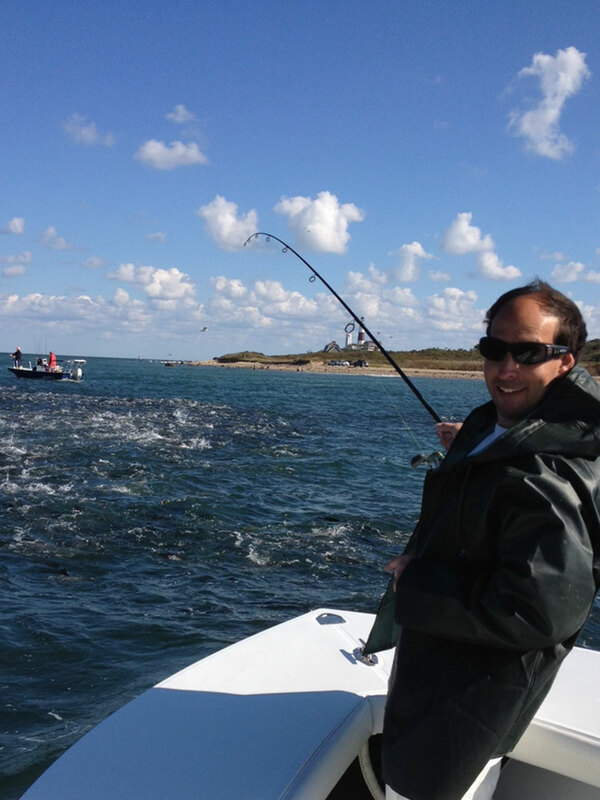 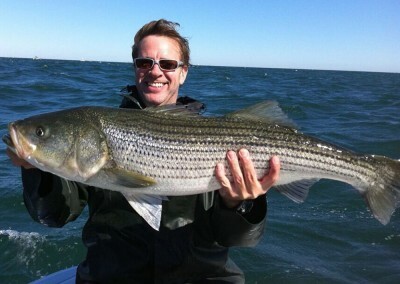 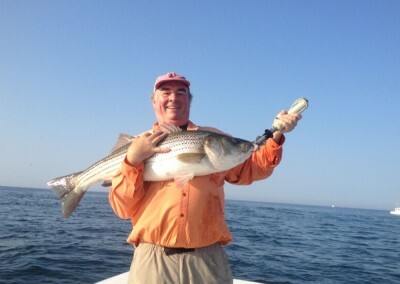 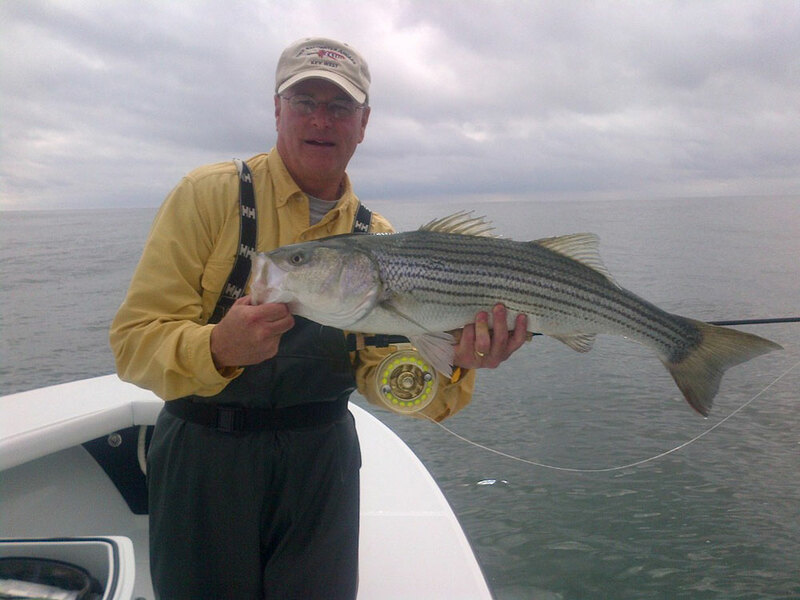 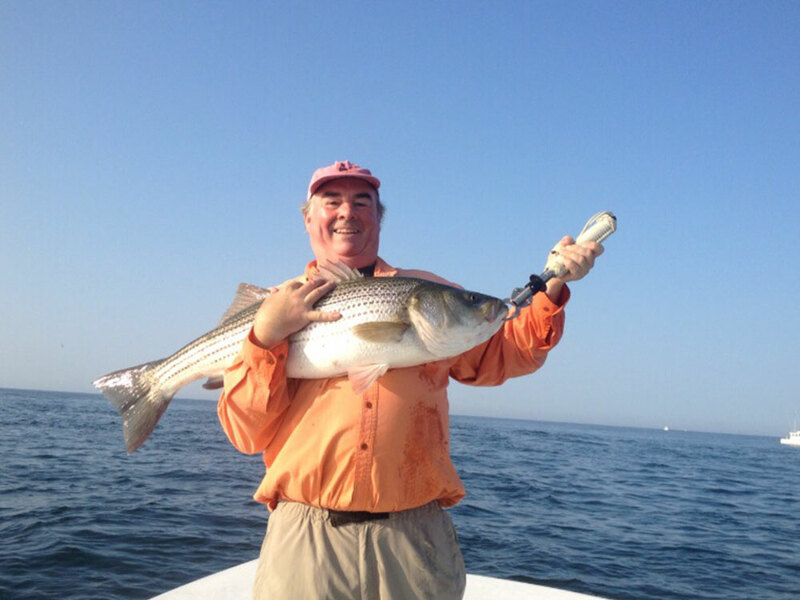 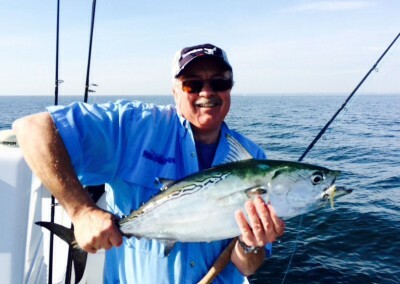 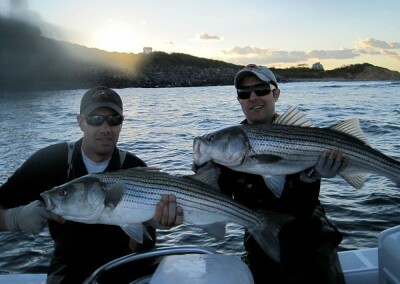 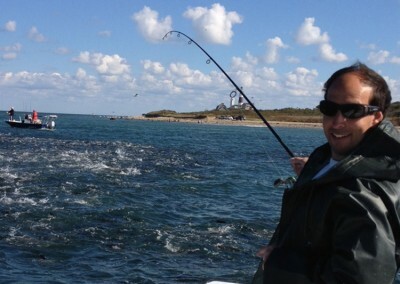 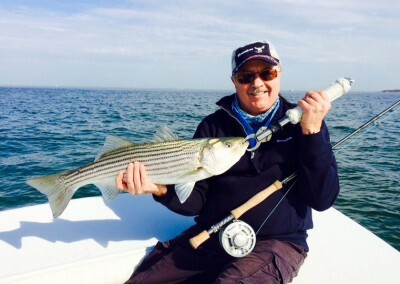 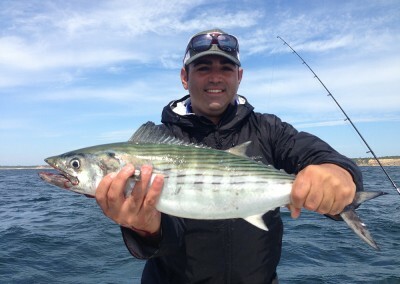 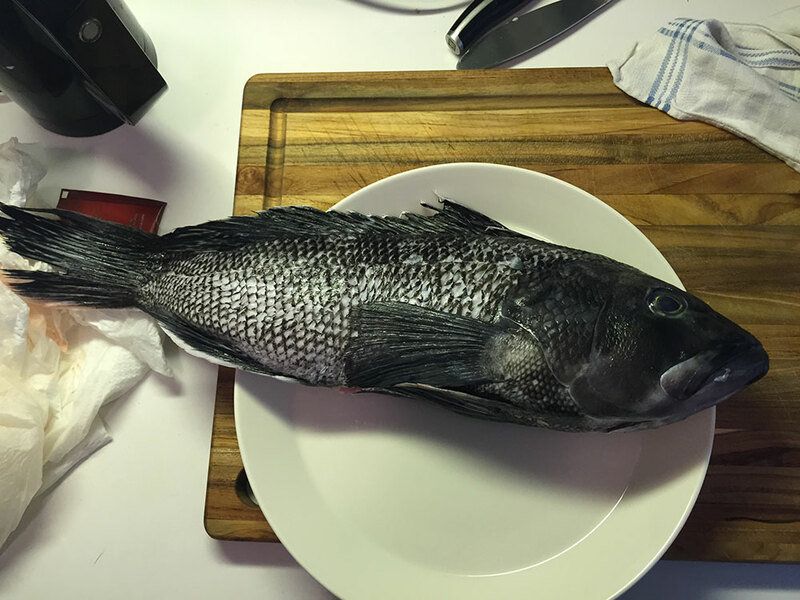 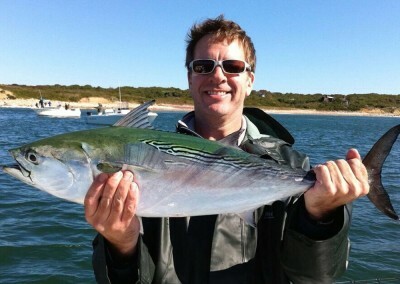 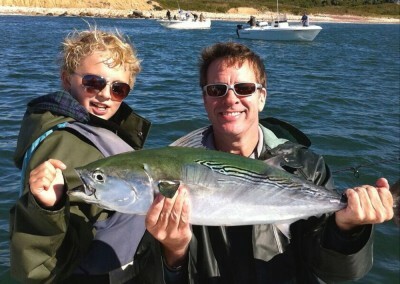 In Montauk waters it is common to catch albies weighing around 6-12 pounds (16 lbs., my personal best!). 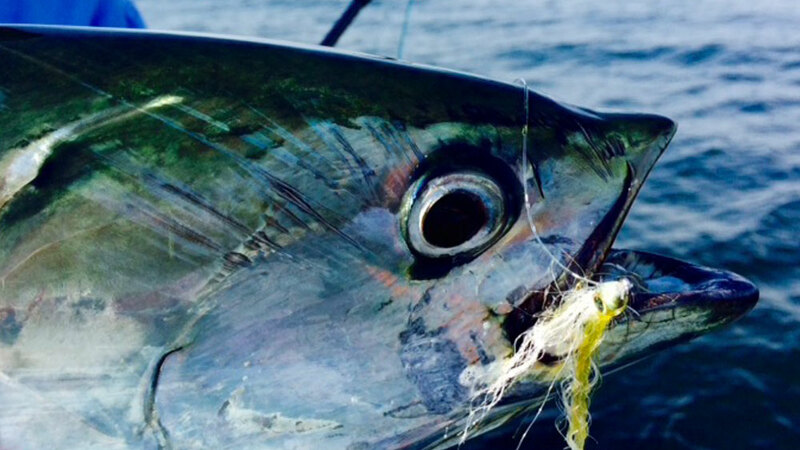 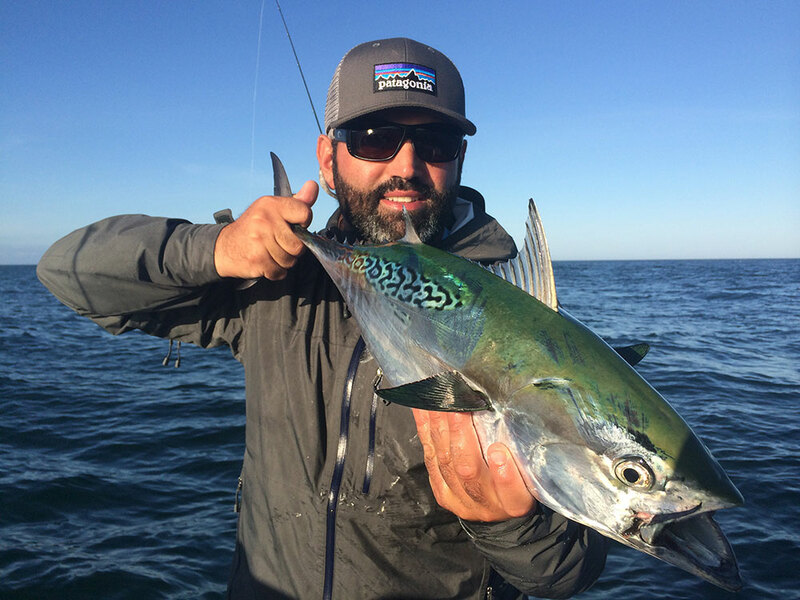 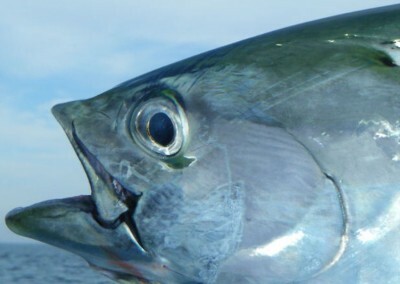 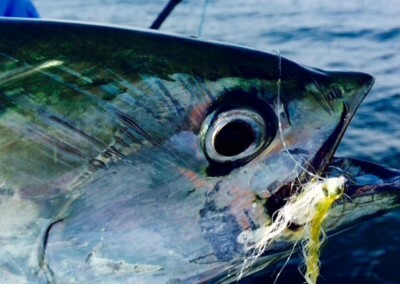 Even at the low end of the scale, false albacore are capable of heart stopping runs, repeatedly taking anglers into their backing. 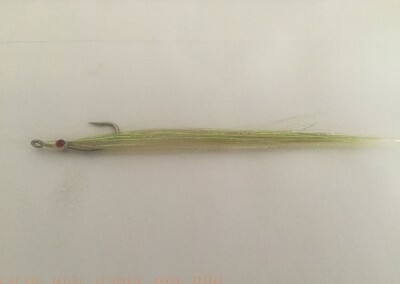 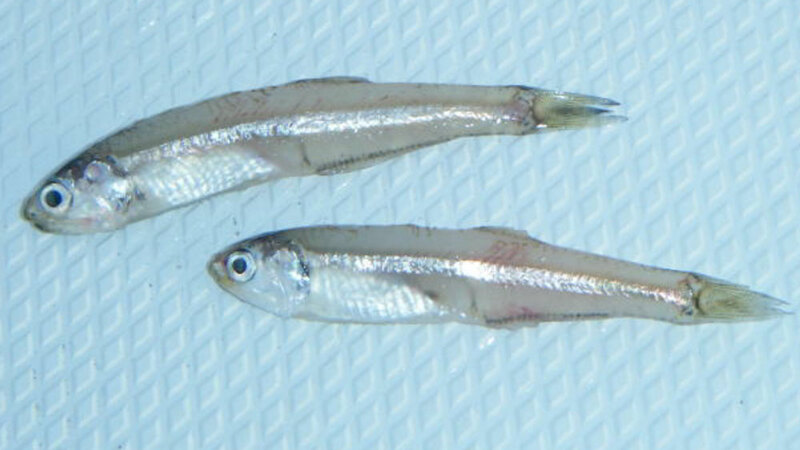 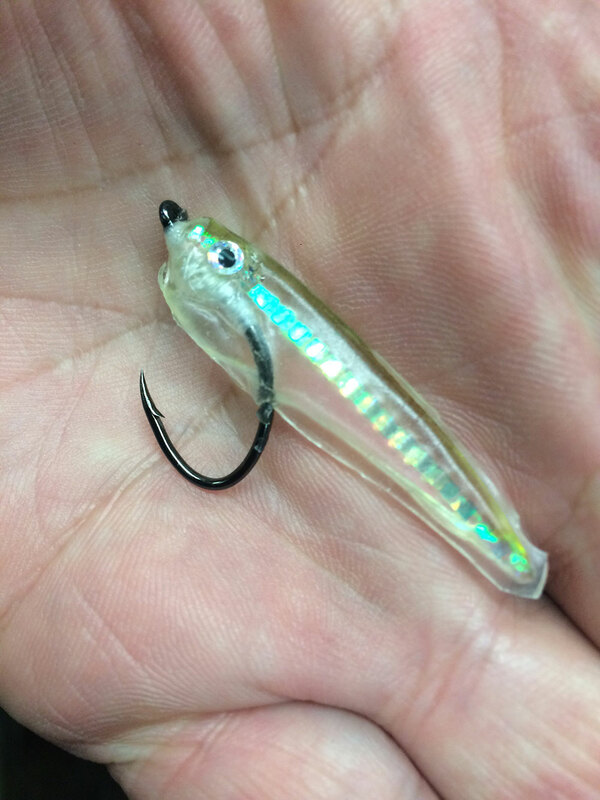 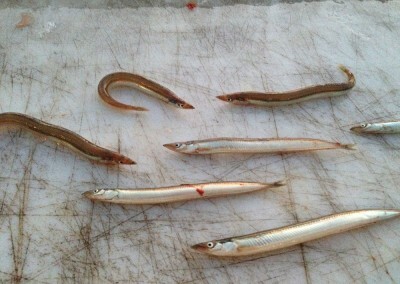 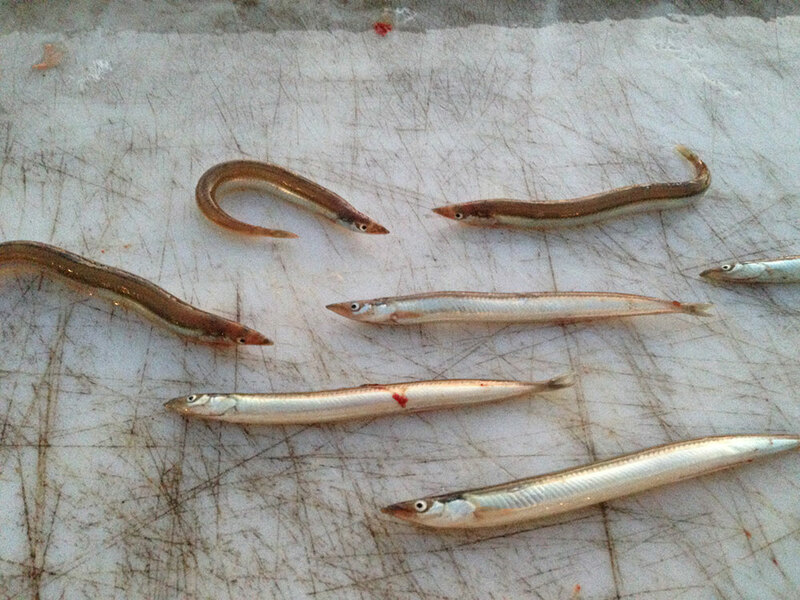 Fly fishermen typically employ 2-3″ epoxy or “softy” minnows which perfectly mimic bay anchovies, one of the most prevalent bait fish in the water column. 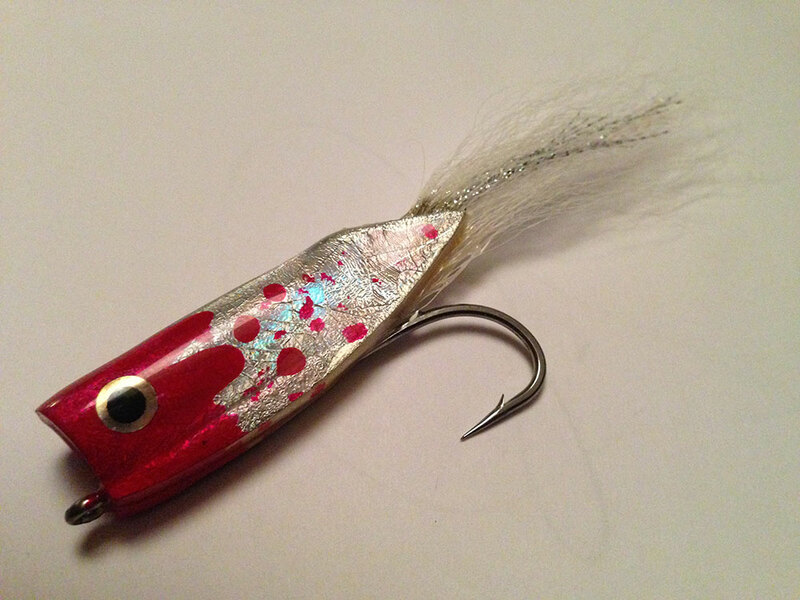 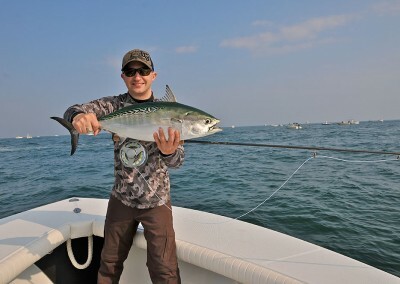 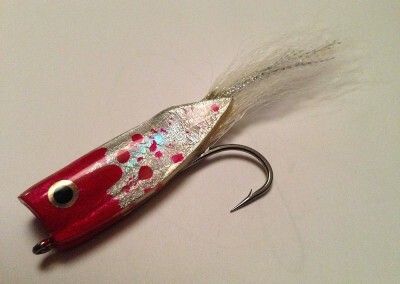 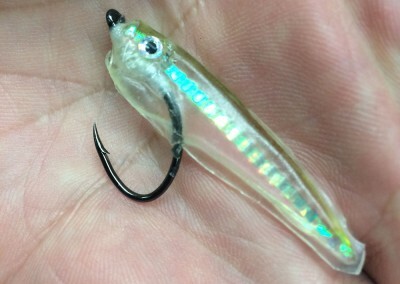 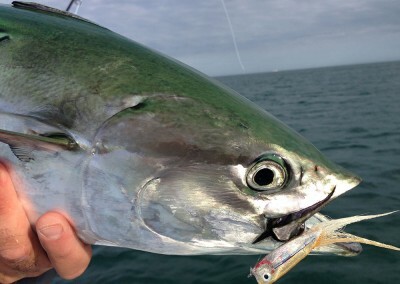 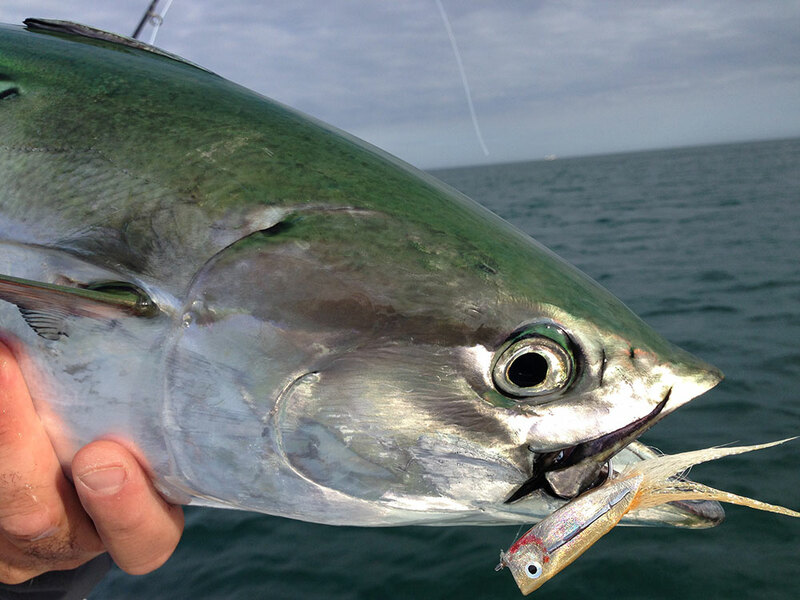 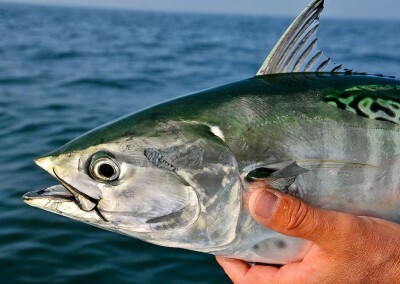 Light tackle fishermen have also been successful taking false albacore with small, slender metallic jigs like Deadly Dicks and plastic stick baits such as Slugos. 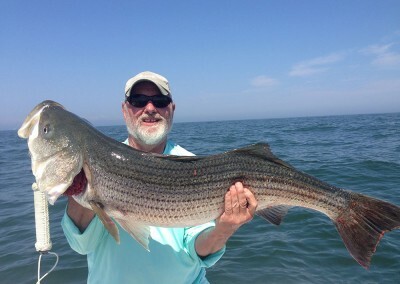 Merritt has been an enormous addition to my fishing life, and that is saying something, because I am an addict and have fished with lots of captains. 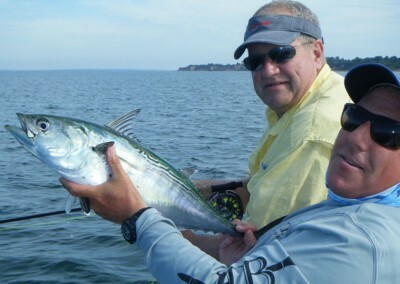 He has patiently and skillfully advanced my fly fishing skills, and seems always to get me on some good fish. 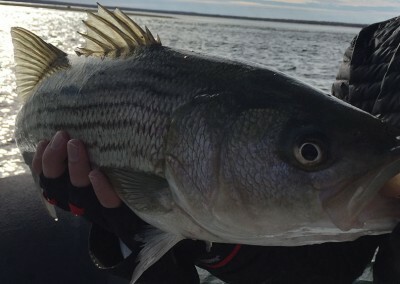 He always knows what is going on in the area and tries as hard as anyone I have ever fished with. 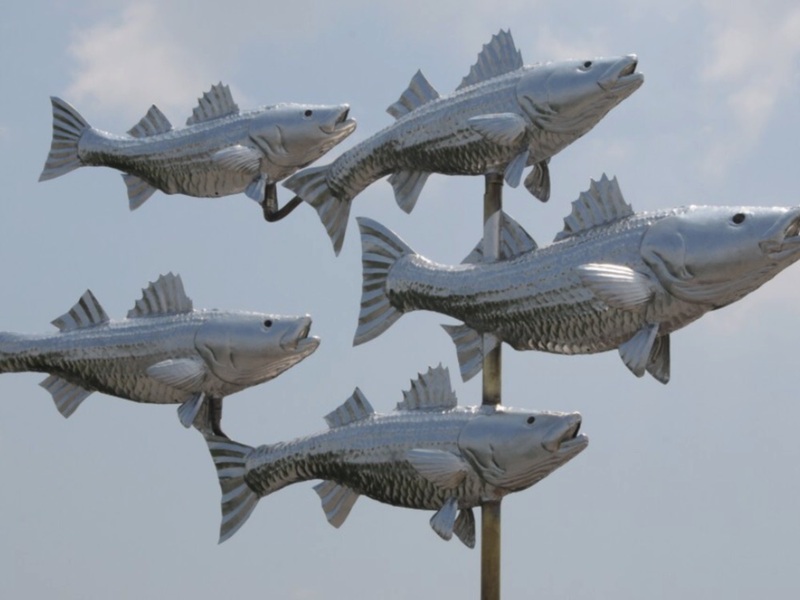 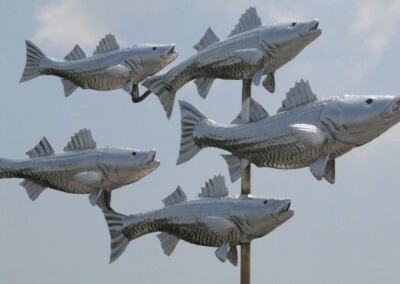 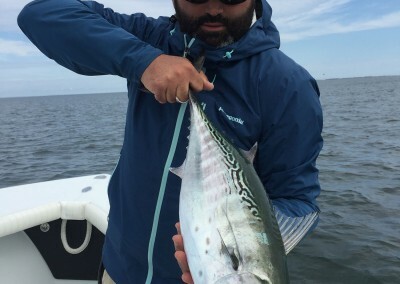 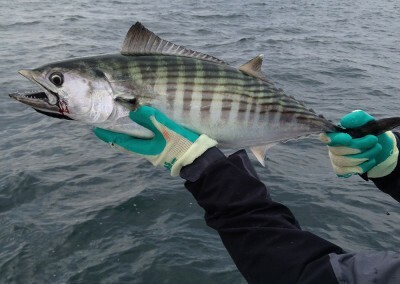 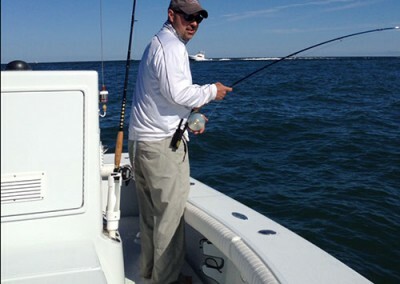 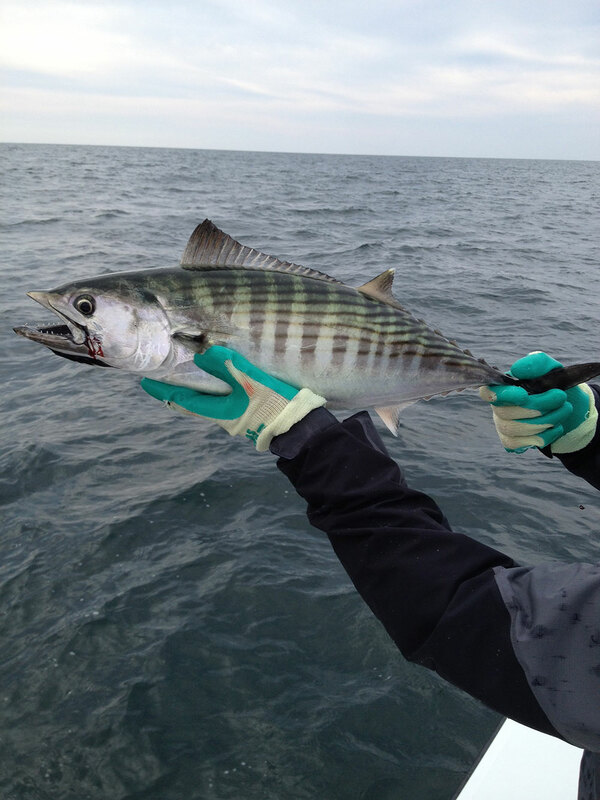 Once anglers get a few false albacore under their belts, everyone then turns their attention toward striped bass. 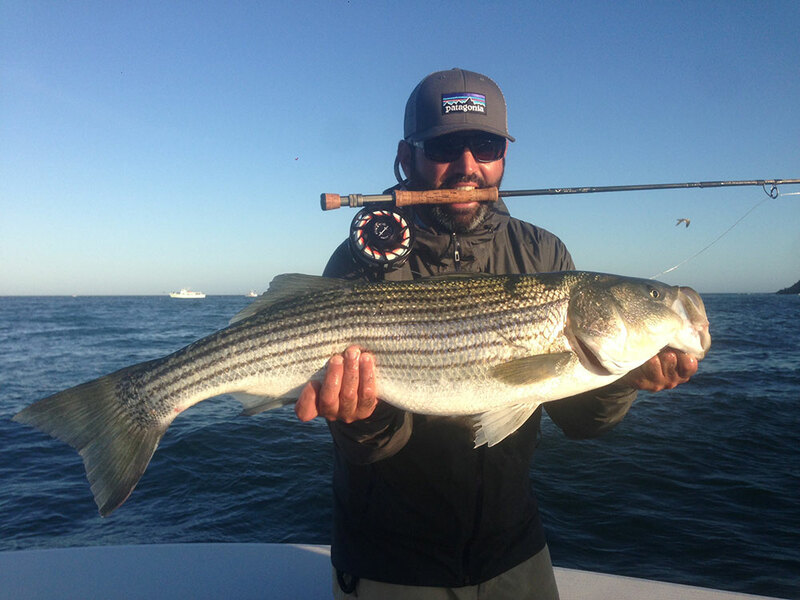 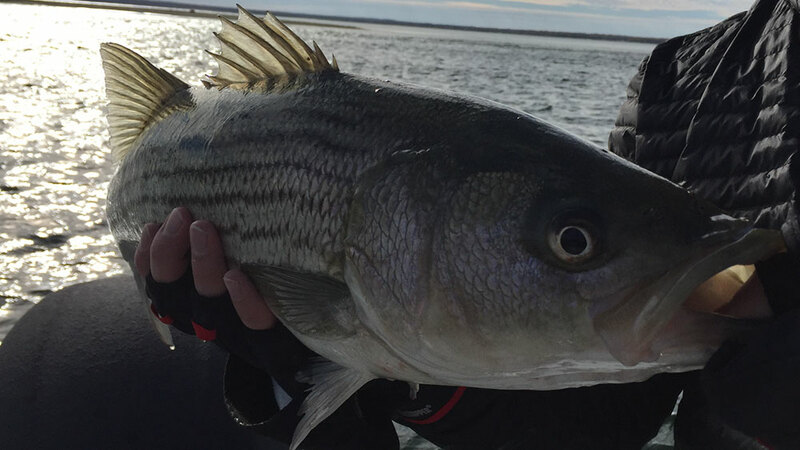 With water temperatures steadily dropping, striped bass become aggressive again in their attempts of packing on as much fat and protein for their long journey south. 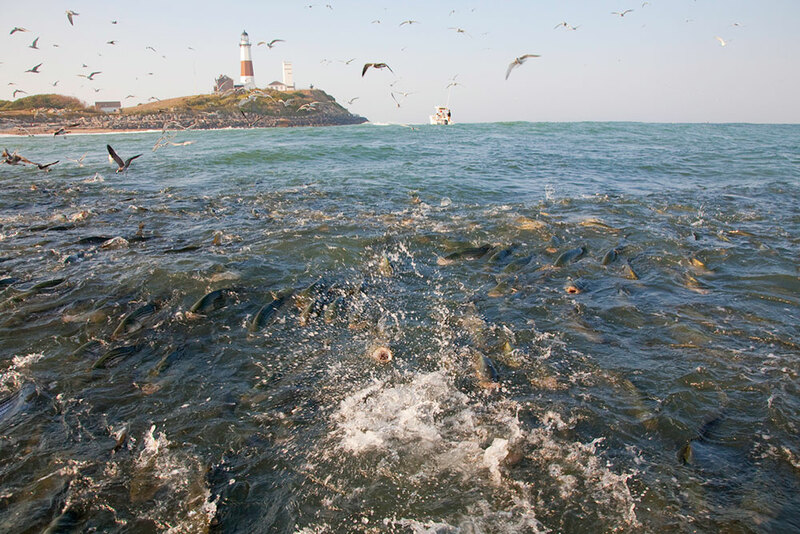 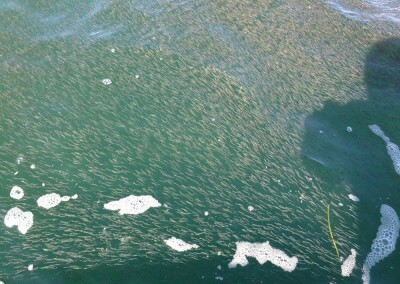 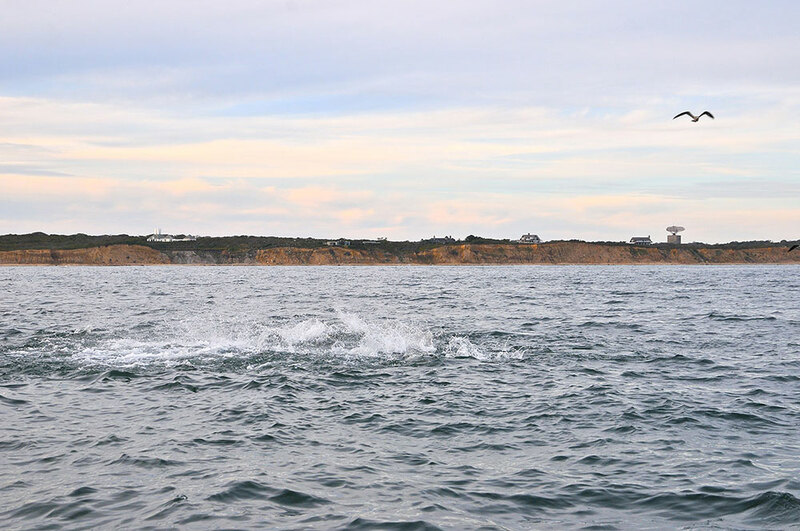 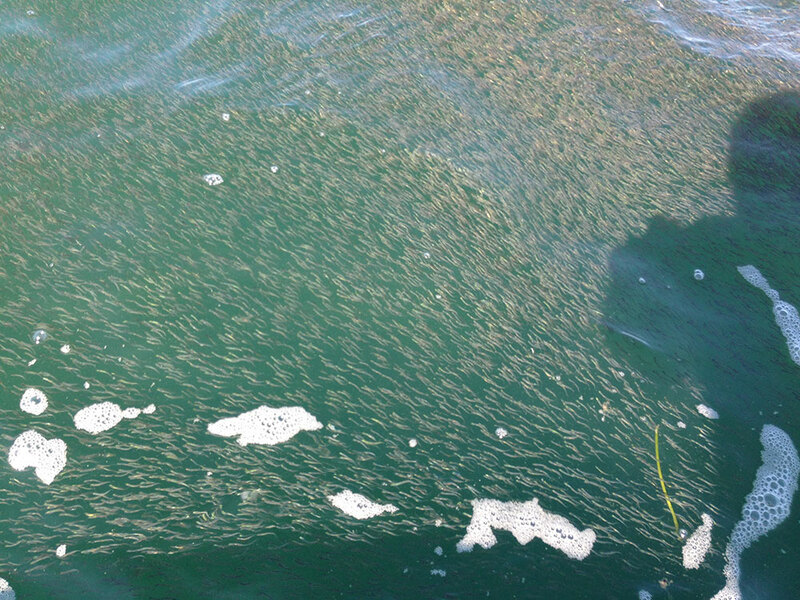 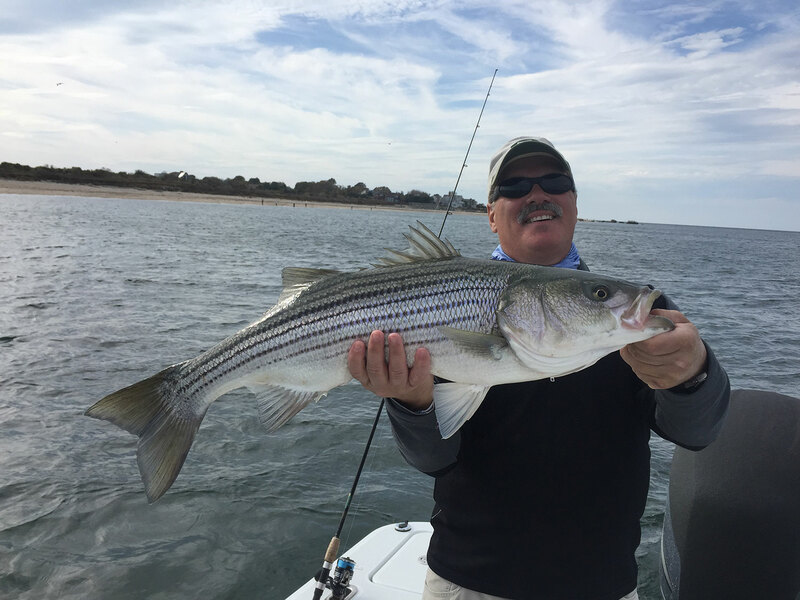 Throughout a charter during the Fall run, one can be literally surrounded by acres of striped bass as they blitz on huge bait balls of bay anchovies on the water’s surface! 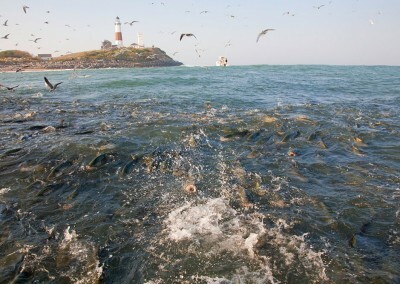 It is quite thrilling to witness this natural phenomenon first hand. 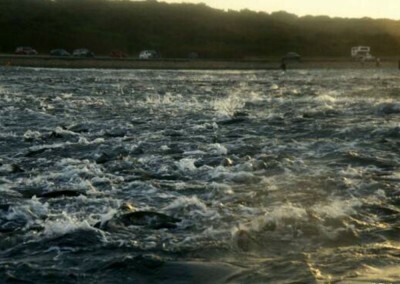 I’ve actually had anglers put their fly rods down just to watch and listen as the melee unfolds! 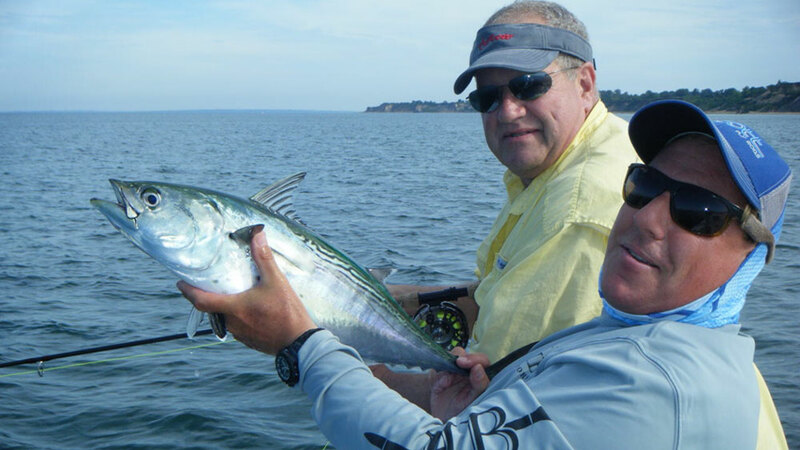 Once an angler has regained their composure, this can become a wonderful opportunity to “rack up” on numerous fish. 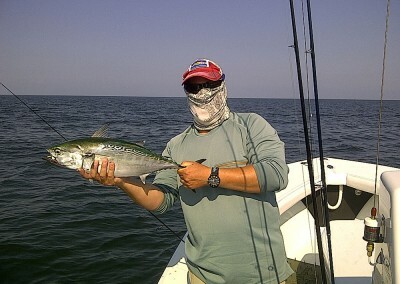 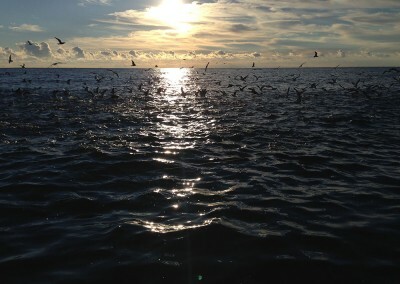 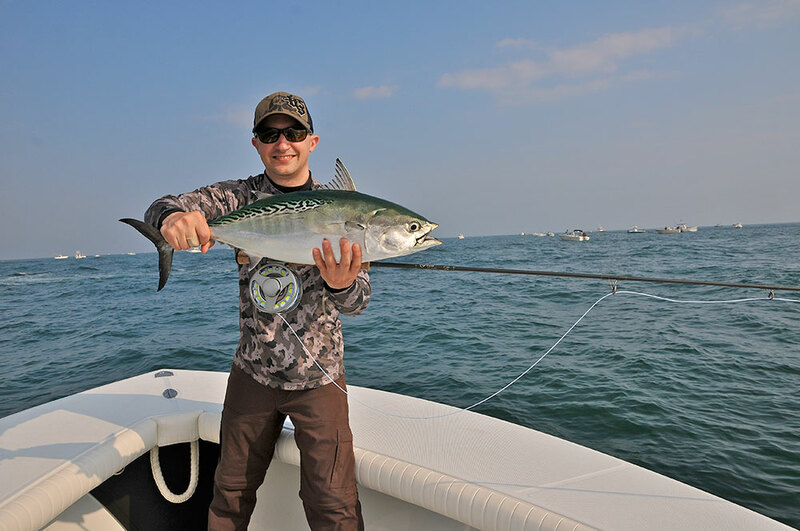 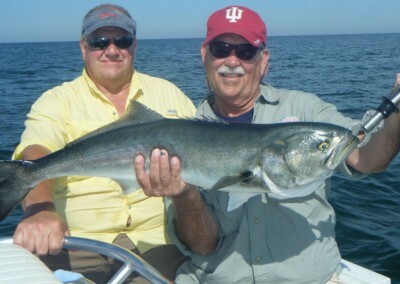 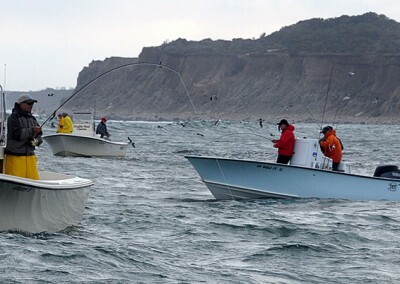 Often times bluefish and false albacore will join in the party. 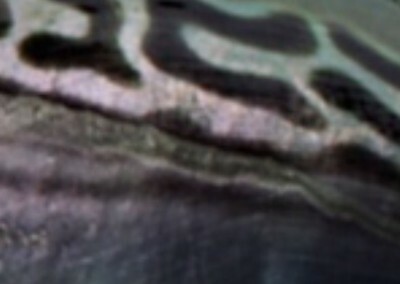 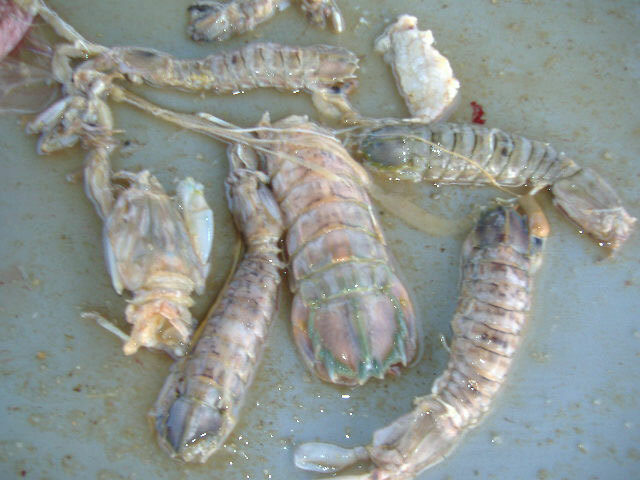 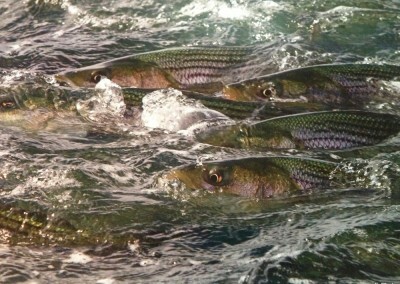 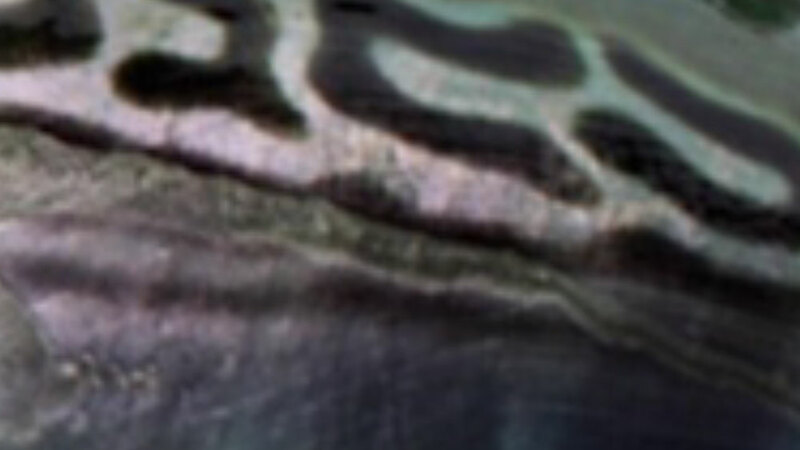 However they are usually relegated to feeding on the edges of the blitzing striper scrum. 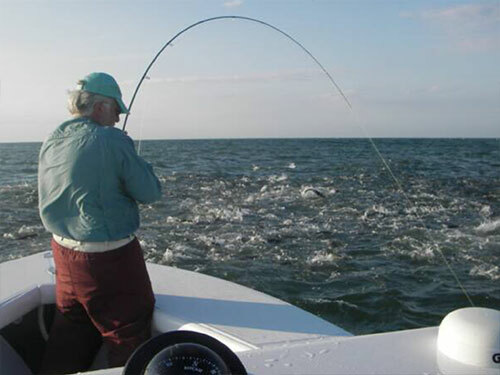 With an accurate cast, one can actually select which species of fish he or she would like to catch! 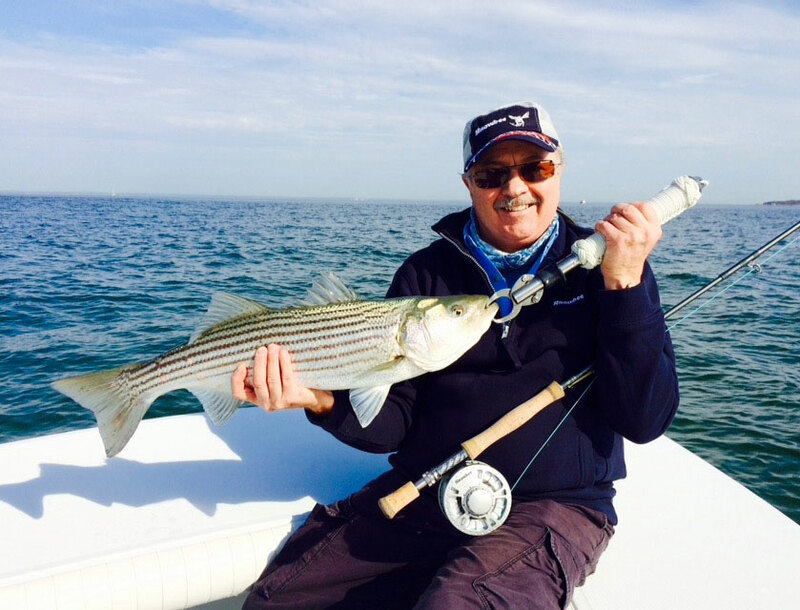 The fabled North East “grand slam” may be attained again and again as the concentrations of blues, albies and stripers are at their peak! 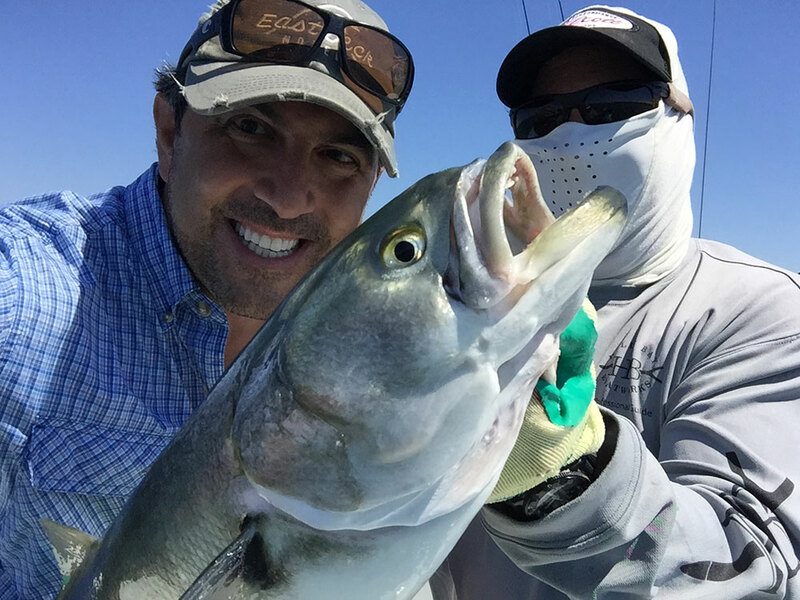 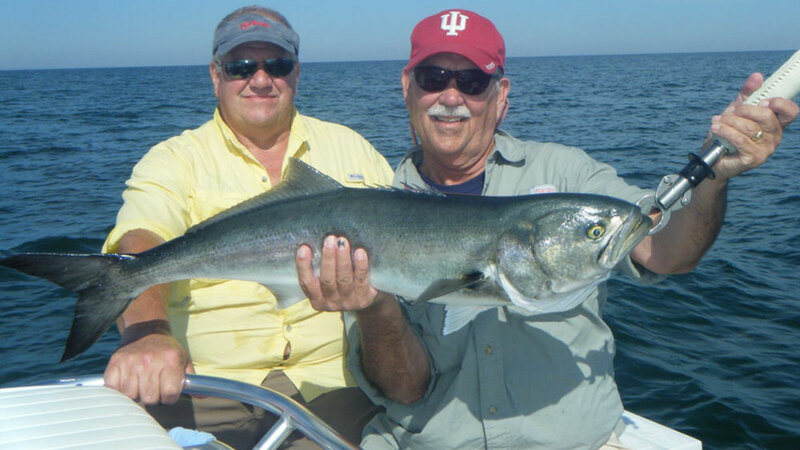 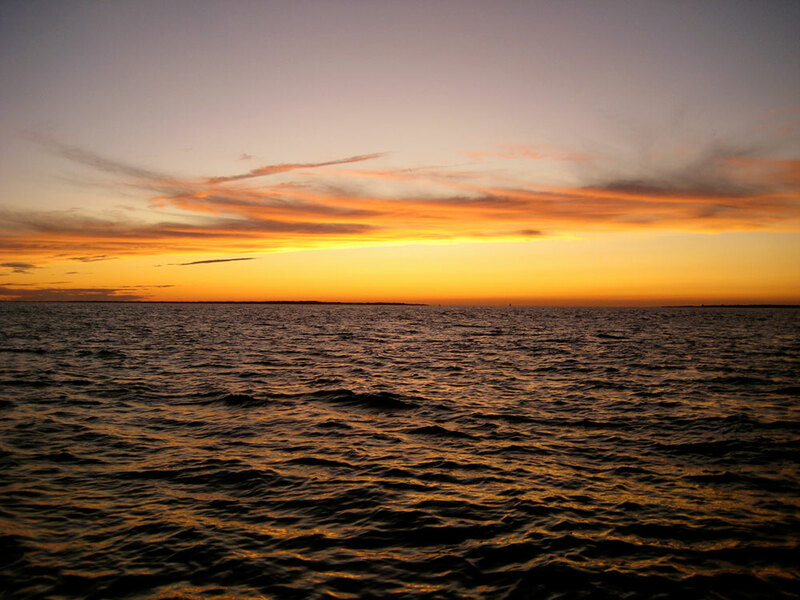 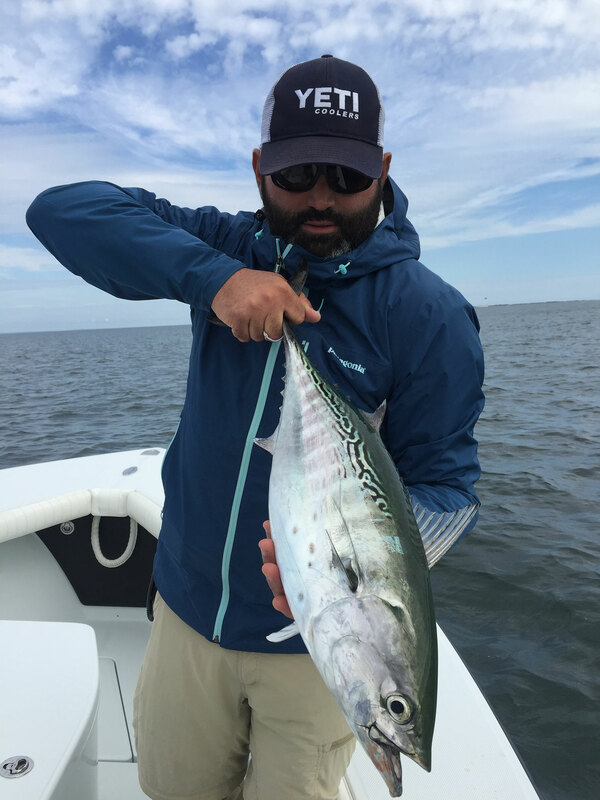 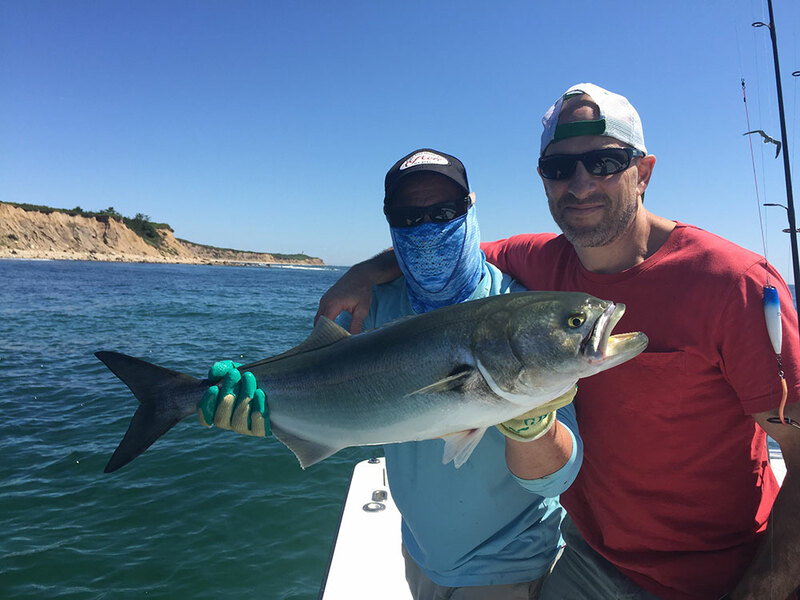 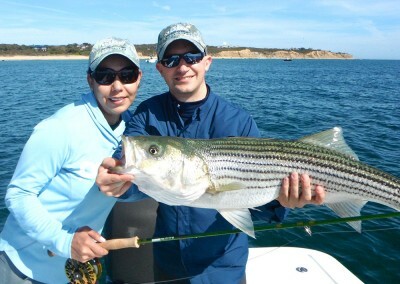 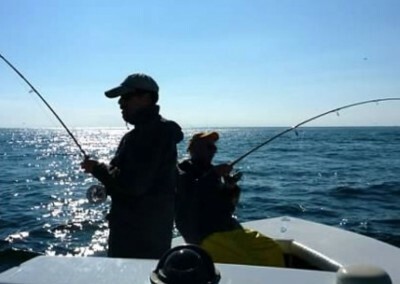 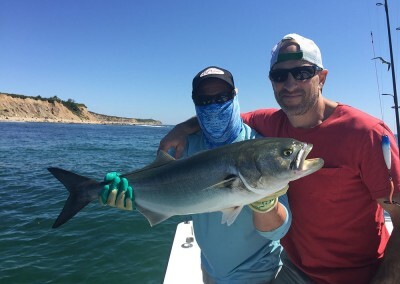 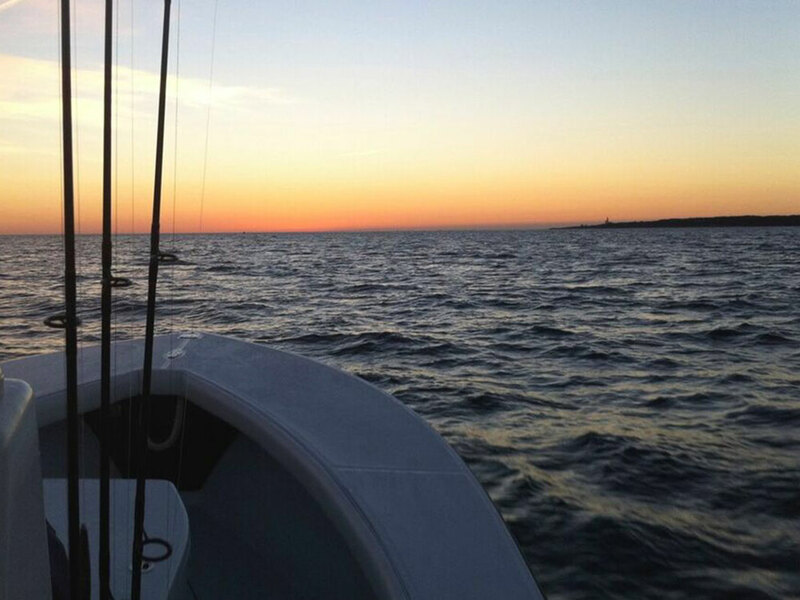 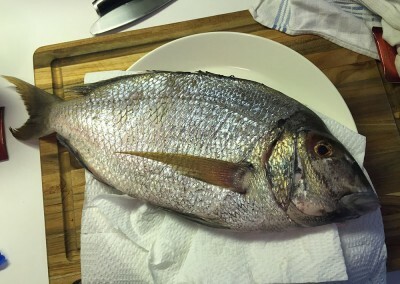 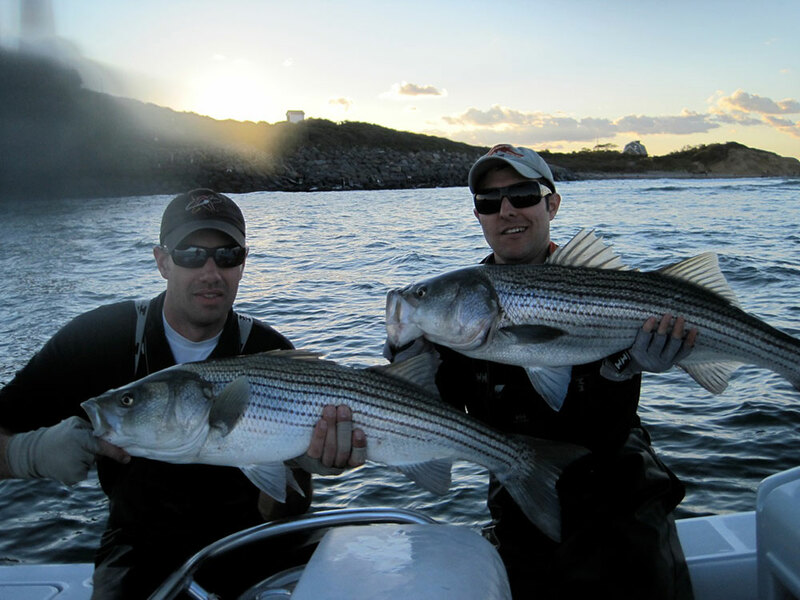 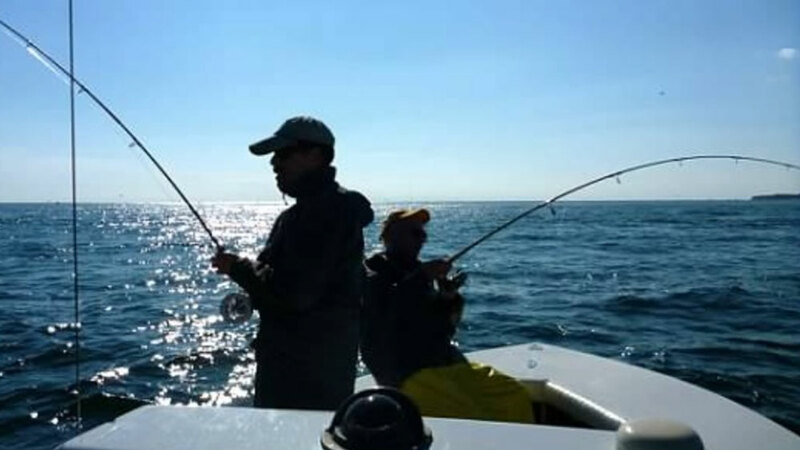 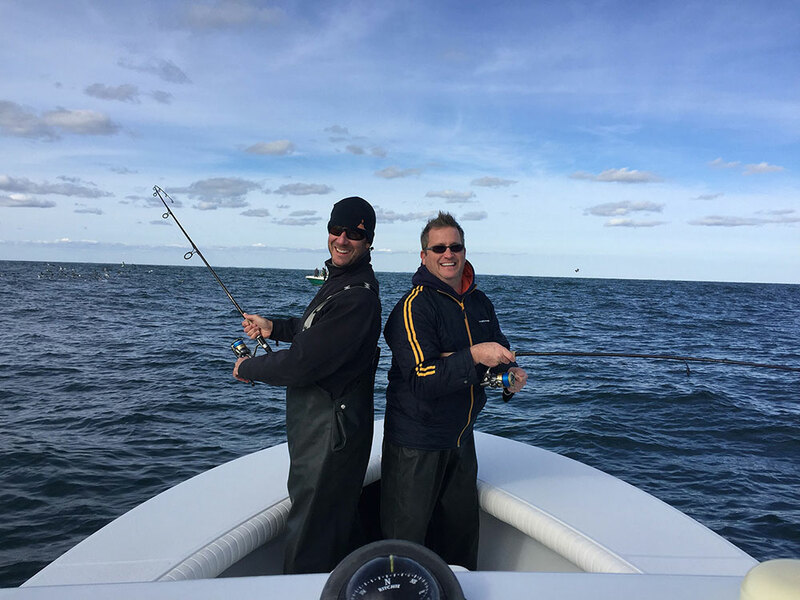 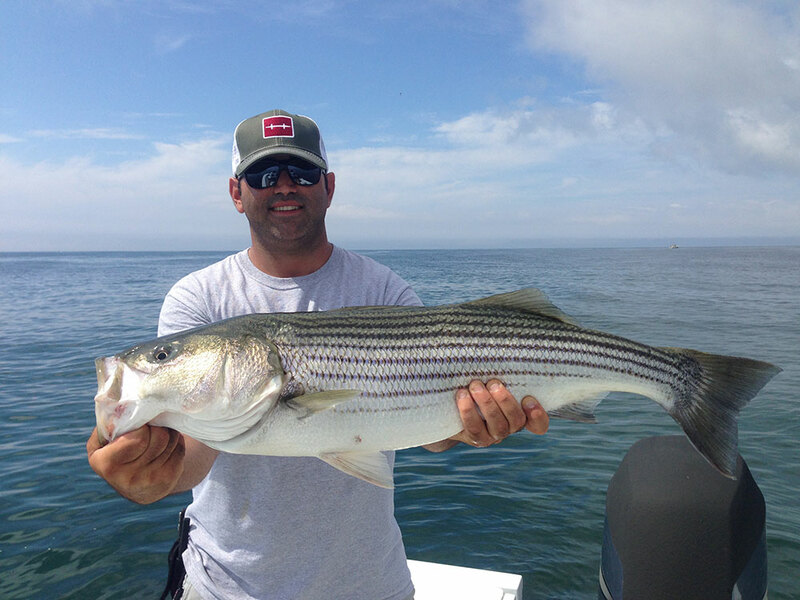 Only a matter of a few hours drive from the tri-state area, let the surrounding waters of Eastern Long Island and Montauk, New York be your fishing grounds! 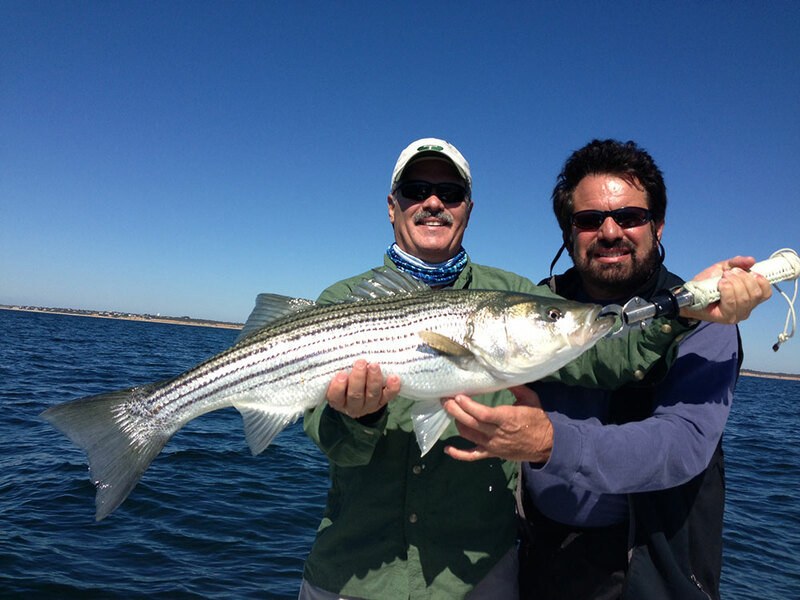 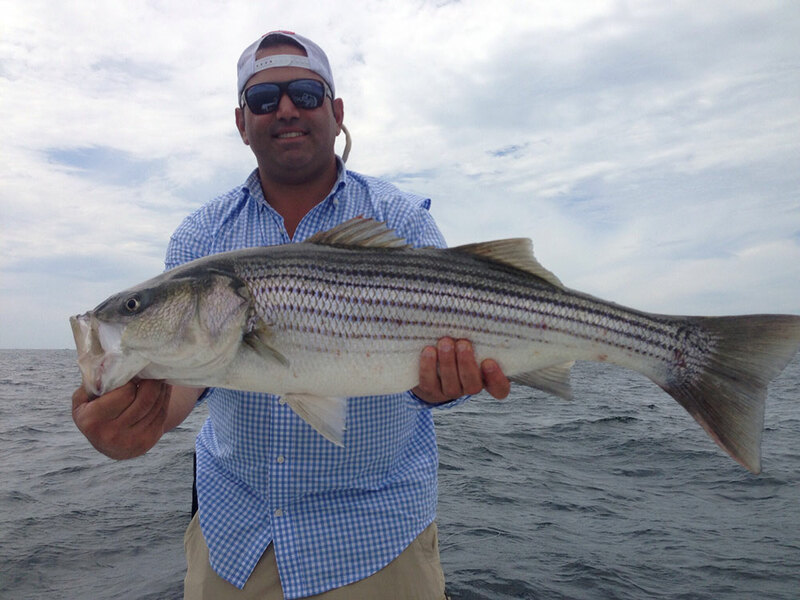 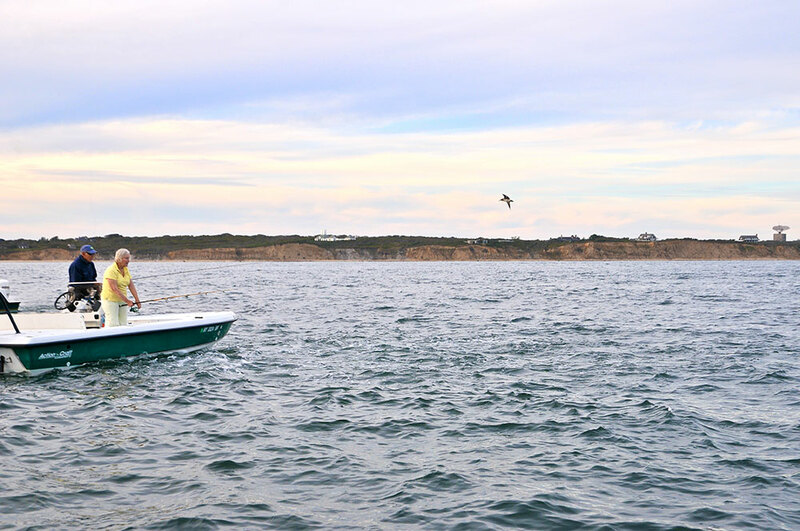 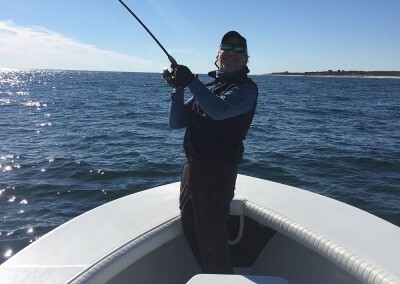 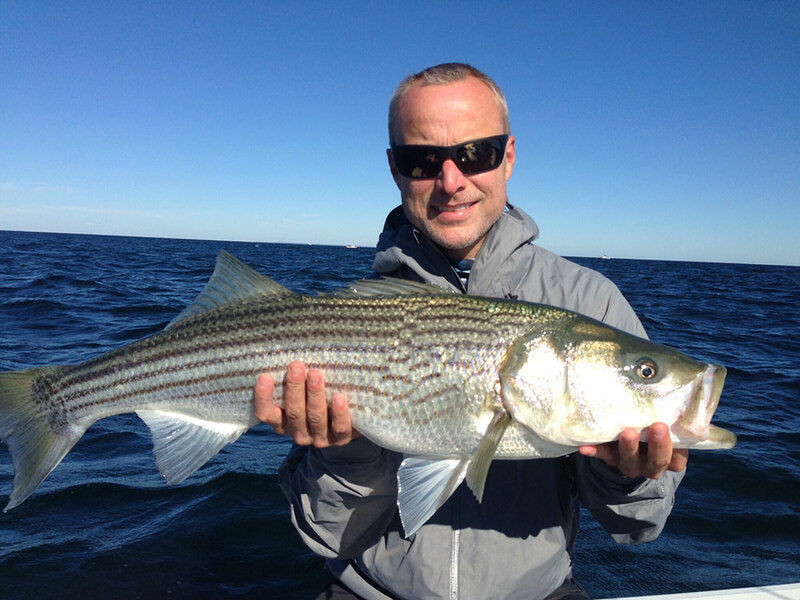 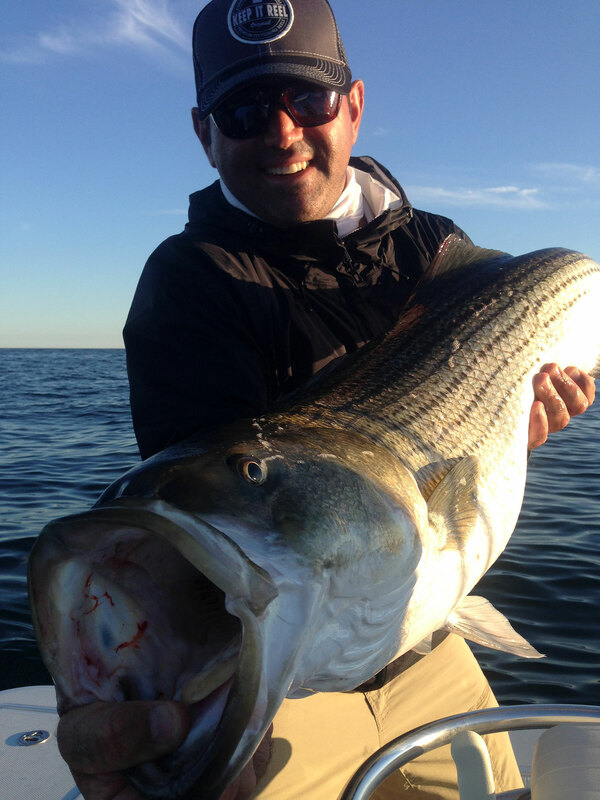 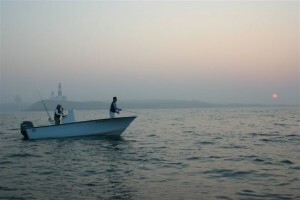 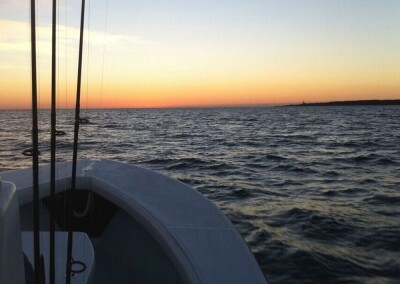 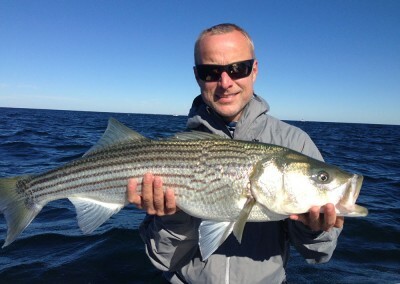 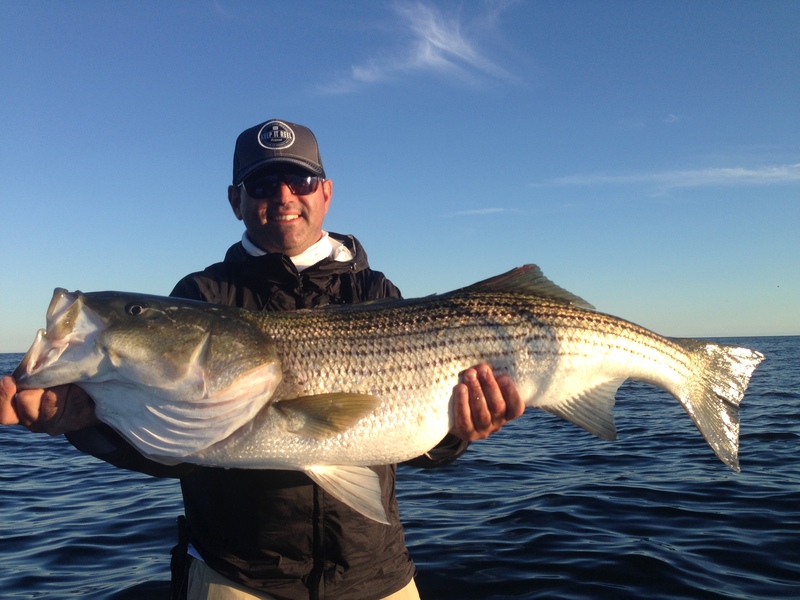 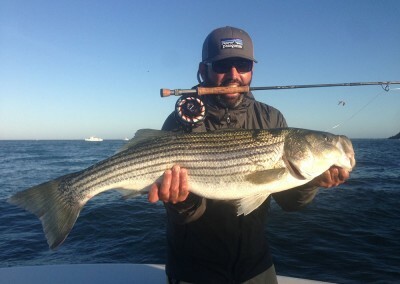 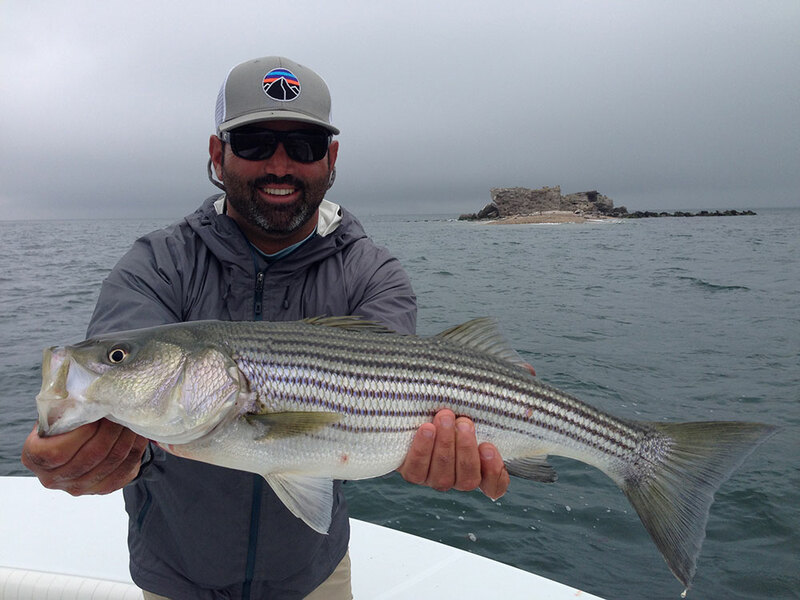 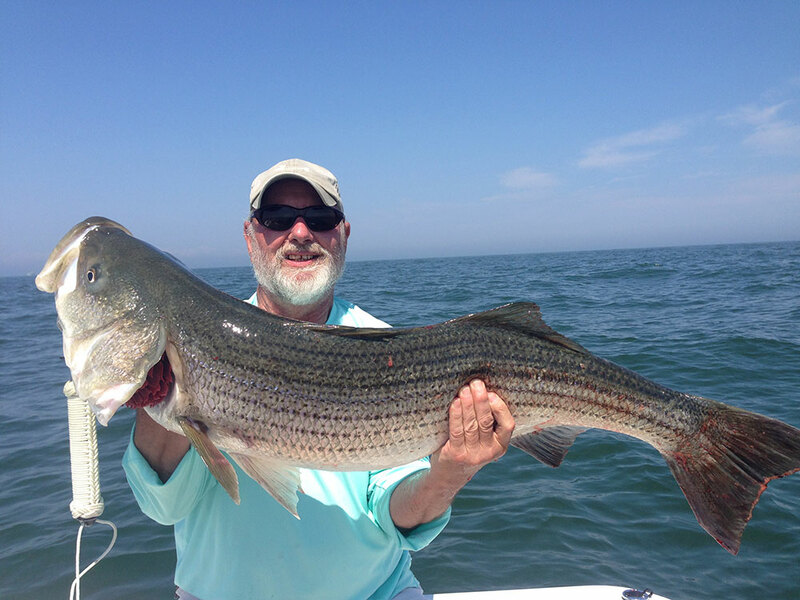 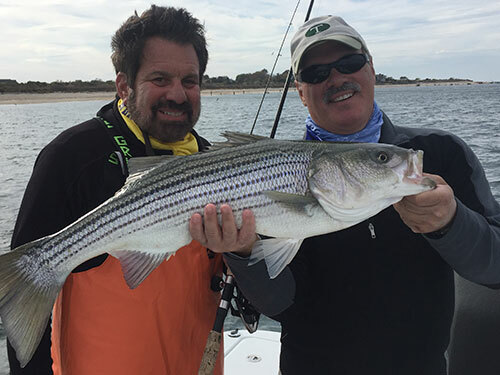 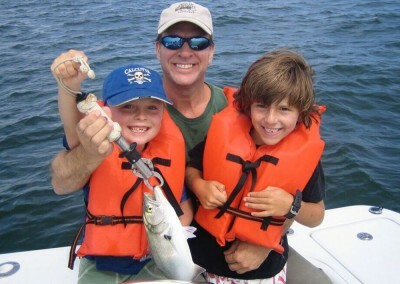 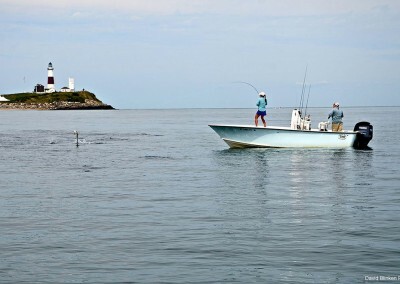 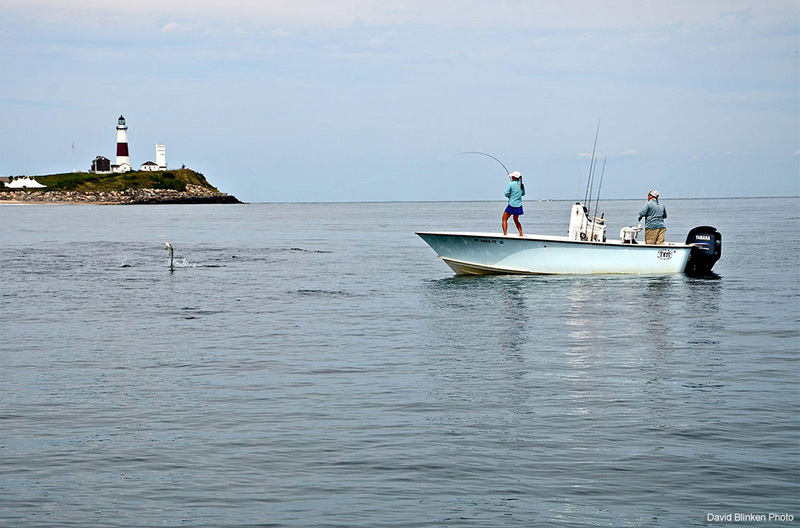 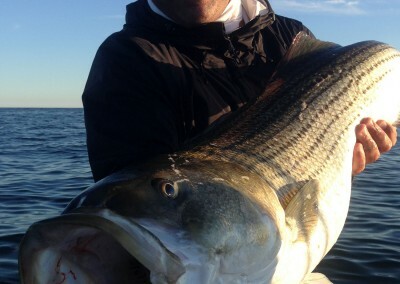 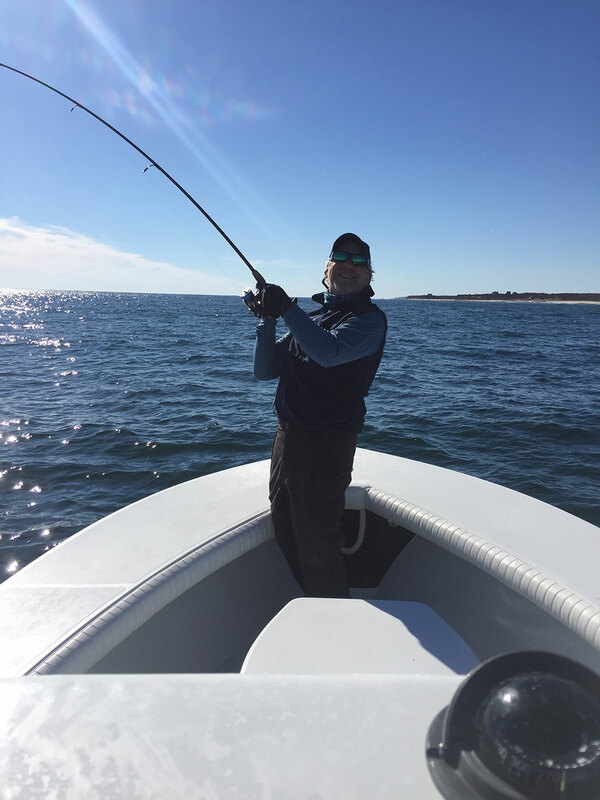 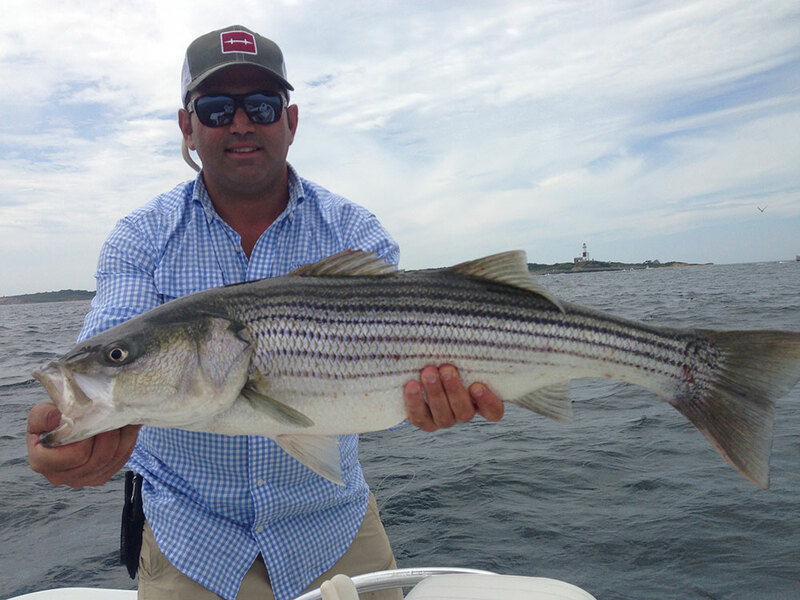 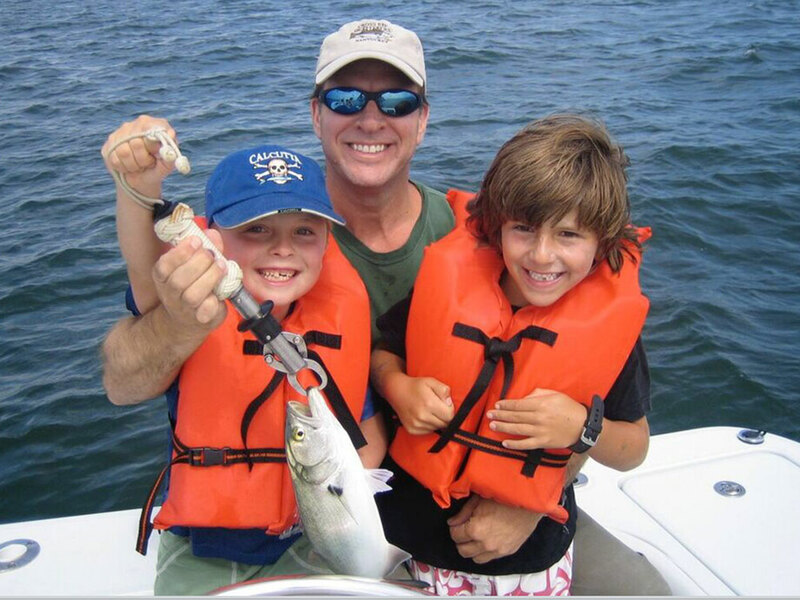 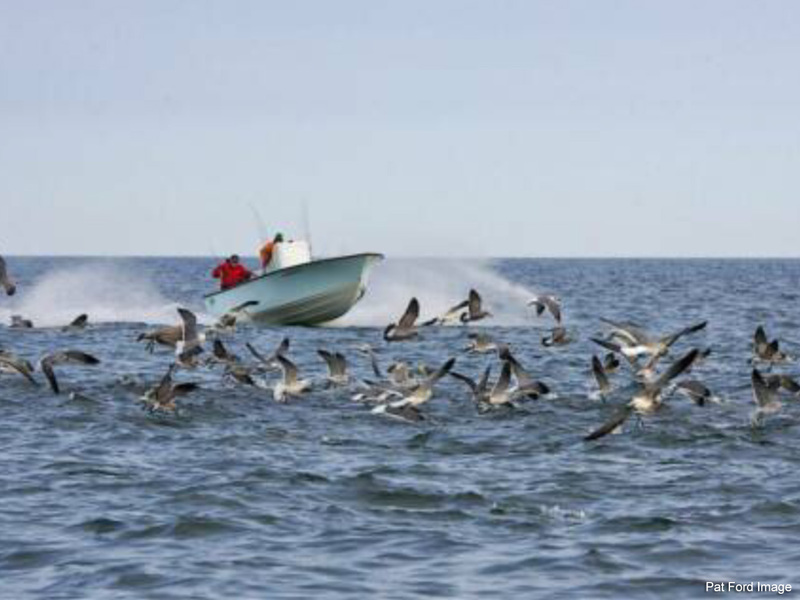 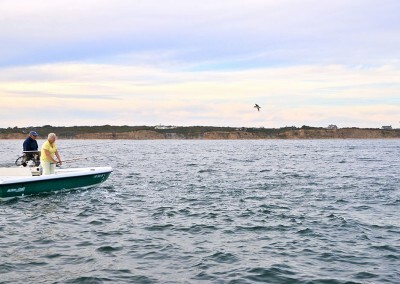 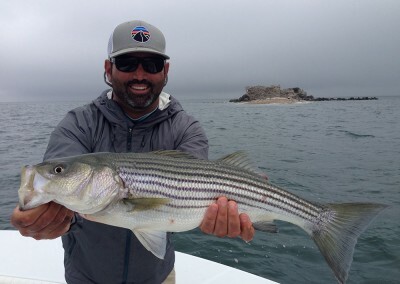 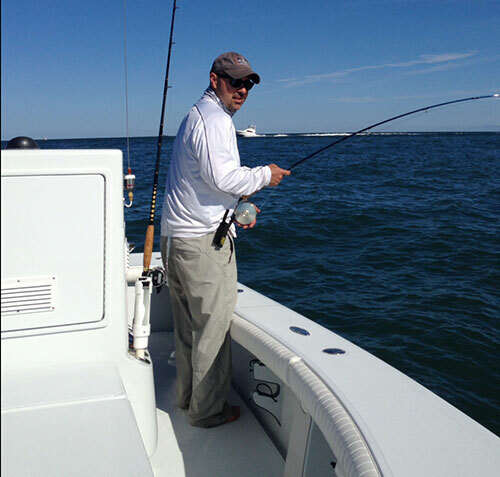 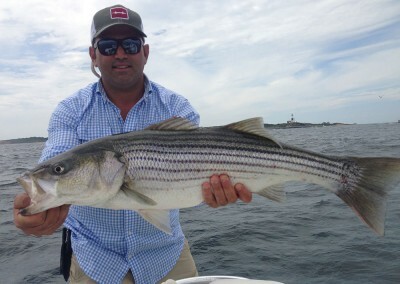 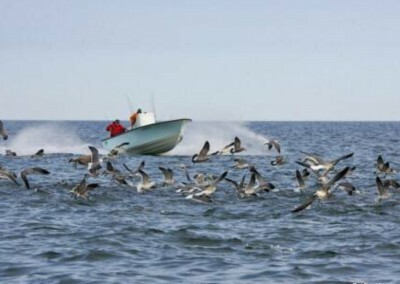 Whether you’d like to test your mettle on the flats of Shinnecock and Gardiner’s Bays or reap the rewards of the Fall bonanza in Montauk, Captain Merritt White will guarantee a memorable, fun filled, productive day on the water!